Parasite of the Day: Alaria spp. Today we are featuring a guest post by Dr Emily Uhrig, a postdoctoral research fellow currently at Linköping University, Sweden. She has written a post on a study that she and her colleagues conducted on a parasite that congregate in the tail of garter snakes, and the role that these reptiles play in the life cycle of this parasite. Parasites are found in a tremendous range of hosts spanning the animal kingdom and beyond. However, the consequences of parasites for their hosts have not been thoroughly studied in many cases and this is particularly true for parasites infecting snakes. Even in very common snakes, such as the garter snake which is widespread throughout North America and has been studied extensively with regard to many aspects of their biology, their parasites have received little attention. During my PhD research, I aimed to shed light on snake parasites by focusing on the red-sided garter snake of Manitoba, Canada, and I was especially interested in a trematode of the genus Alaria. Interestingly, Alaria infections in snakes have been noted in the literature for years, but mostly in ecological surveys of parasite communities, and their possible effects on the snakes’ evolutionary fitness were unclear. Alaria spp. have complex life cycles consisting of a snail host in which Alaria eggs multiplies into asexual stages called sporocysts, which then produce multiple clonal larvae called cercariae. These cercariae emerge from the snail and infect frogs. Within the frog, Alaria develop into mesocercariae, a non-reproductive ‘resting’ stage. A mammalian carnivore, usually a canid (e.g., coyote) or mustelid (e.g., mink), serves as the final host in which the parasite reaches sexual maturity. So where does the snake fit in? It turns out, the garter snake is a paratenic host, also known as a transport or reservoir host, which ends up accumulating Alaria mesocercariae through eating frogs. Paratenic hosts are not physiologically necessary for the parasite’s development as a part of its life cycle, but they help bridge ecological gaps between hosts. In this instance, the snake, which has quite a penchant for frogs, helps Alaria move from a (mostly) aquatic intermediate host to its terrestrial final host. Interestingly, Alaria spp. can infect many species paratenically - including humans; however, since relatively few humans fall prey to carnivores, Alaria that end up in humans are usually at a dead end. Tail morphologies observed in red-sided garter snakes. Arrows mark the position of the cloaca. Photos modified from Figure 1 of the paper. Once inside the snake, the life of Alaria gets even more interesting. In the field, we commonly observe snakes to have ‘puffy’ tails where the end of the tail is obviously swollen and often discoloured. These puffy tails are fragile and can rupture with the gentlest handling or even by the snake’s own movement along the ground. The ruptured tail oozes a pink-coloured fluid which, on close inspection with the naked eye, clearly contains moving organisms, and microscopic examination reveals multitudes of writhing Alaria mesocercariae. Thus, the parasites apparently make a rather impressive migration through the tissues from the snake’s gut to its tail. Left: Ruptured tail with ‘ooze’ containing Alaria; Right: Alaria mesocercaria from Figure 2 of the paper. It is not uncommon for a snake’s tail to harbor several thousand mesocercariae, and the record holder in our studies had over 6000 mesocercariae in its tail. Alaria infections seem to be ubiquitous in our study populations as all snakes examined have been infected to some degree. Parasite mesocercariae are nearly impossible to visually identify to species level because different species are very similar in morphology. Thus, we used genetic analyses to determine that the snakes in our study population are often co-infected with at least three different Alaria species (primarily A. mustelae and A. marcianae, but also another as yet unidentified species). Having identified the infection, the next obvious question to ask was, what are these parasites doing inside the snake’s tail? To answer this, we collected tails from recently dead snakes and prepared them for histology. 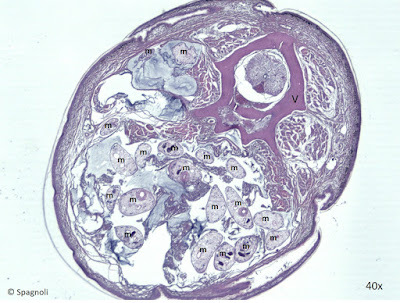 Examining those samples, revealed that, in severe infections, the tail essentially becomes a bag of parasites and the tail musculature is destroyed (similar to what another parasite – Curtuteria australis – does to the foot of a New Zealand clam), likely through compressive effects of so many parasites in a relatively small space. The mesocercariae tend to be surrounded by pockets of mucous, the accumulation of which leads to the swollen puffy tails. The source of the mucous (host or parasite) is not entirely clear, but we believe it is the host’s body attempting to ‘wall-off’ the infection. Interestingly, some highly infected snakes do not have puffy tails, which suggests there may be variation in host tolerance of the infection. 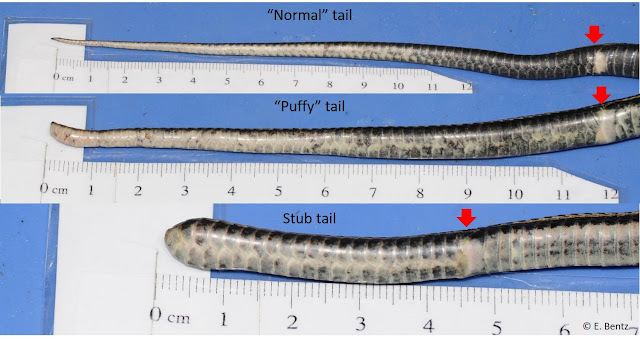 As parasites destroy the tail musculature, the connection of the tail to the rest of the body is weakened and the likelihood of tail loss is increased. Loss of the tail is probably beneficial to the parasite because it could help facilitate transfer to the definitive host. In an attempt to catch a fleeing snake, a predator may come away with only the tail, especially if the tail is fragile, so aggregating there could prove a useful strategy for Alaria transmission. As we often observe wild snakes that are missing portions of their tails (stub tails), it may be common for predators to end up snacking on only a tail. Unlike lizards, snakes cannot regrow their tails so tail loss is permanent, and also costly. Previous work found that males with stub tails have compromised reproductive ability. During the garter snake’s mating season, as many as 100 males compete for a single female. In these “mating balls”, males use their tails to wrestle with one another for access to the female. Males with stub tails are less successful competitors and much less likely to obtain a mating. For females, tail loss also has reproductive implications because males appear to rely on female tail length to align properly with her cloaca during mating. When attempting to mate with a stub-tailed female, males can misjudge the location of her cloaca, reducing the changes of a successful copulation. Thus, through mechanical impairment, Alaria infections can have a direct effect on the fitness of both male and female snakes. The association of Alaria and garter snakes was first mentioned in the literature nearly a century ago, but has received little attention until very recently. Thus, one need not visit exotic locations to learn new things about host-parasite associations as there is still much to learn about the consequences of parasites even in common species. Uhrig, E. J., Spagnoli, S. T., Tkach, V. V., Kent, M. L., & Mason, R. T. (2015). 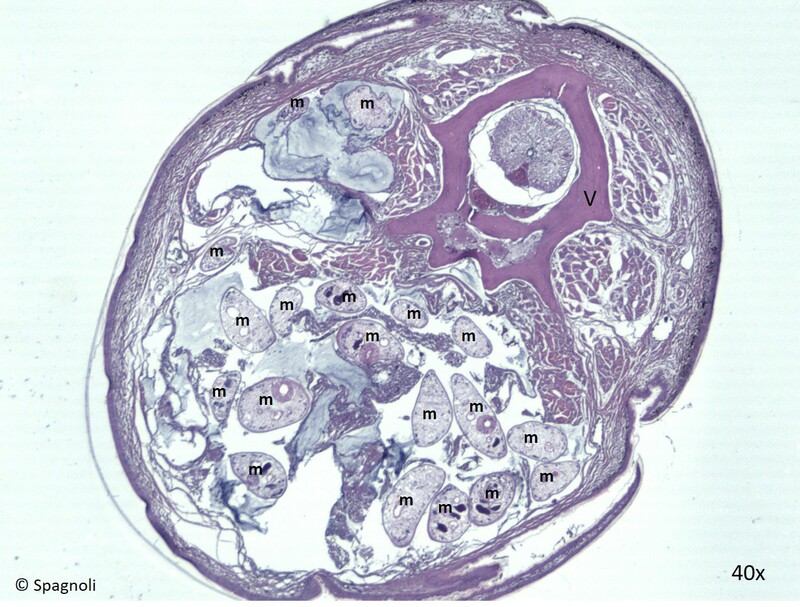 Alaria mesocercariae in the tails of red-sided garter snakes: evidence for parasite-mediated caudectomy. Parasitology Research 114: 4451-4461. This post was written by Dr Emily Uhrig.